Vail’s most historic 52-year-old hotel, The Lodge at Vail, A RockResort debuted the final phase of its renovations just in time for powder skiing over the Thanksgiving holiday. 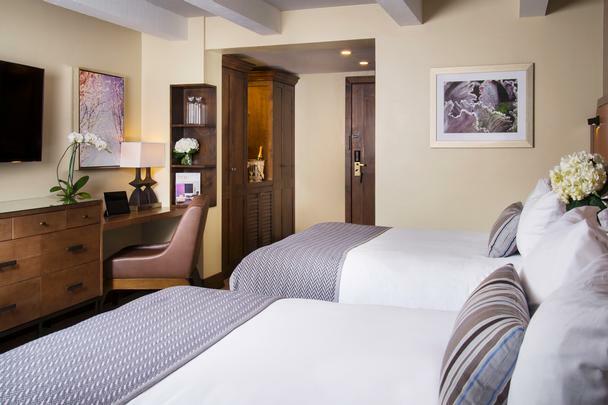 The renovations bring the hotel up to par with both its unrivaled location in the heart of Vail Village and the modern luxury its guests expect in a travel experience. A newly remodeled room at the Lodge at Vail. The Lodge at Vail’s International Wing of hotel rooms underwent renovations in 2008, and now the renovation of the hotel’s remaining 56 hotel rooms, corridors, main stairways and lobby complete the hotel’s transformation. Partners at NeoStudio, who designed Elway’s and the pool renovation last year, were responsible for the architectural design, and Oz Architecture handled the interior design elements. The scope of this renovation includes interior finishes, furnishings, soft goods, lighting and the installation of air conditioning. Colors – The color palette and materials are appropriate for a historic building, but chosen for their luxurious, modern qualities. The rooms feature light walls and soft alpine tones that are reflective of the hotel’s mountain surroundings, and a far cry from bright graphic color palettes popular in many modern hotels. The soft palette is complemented by dark wood accents and tasteful, subdued accent colors throughout the fabric of pillows, bedding and window coverings. Textures – Natural, authentic textures were key to creating a design aesthetic that balanced the soft color palette and speak to the luxury of the hotel. Bedding and other soft goods incorporate luxurious textures, carpeting is soft wool, and seating fabrics, wall coverings and the dark wood is aligned with the property’s history and regional materials. Technology – Working with a historic property has its challenges from a technology perspective, so The Lodge at Vail’s design creatively incorporates technology in its furnishings. The new headboards include power outlets, USB ports and reading lights that are expected for today’s technologically-savvy travelers. The new in-room TVs are larger and are all compatible with Apple and Samsung products for future smart TV offerings. Artwork – The refreshed corridors are adorned with historic images of skiing and Vail that reflect The Lodge’s vintage, alpine flavor as Vail’s first hotel. Artwork in the guest rooms bring in a splash of color with a bright floral pattern. In addition to the guest rooms and corridors, the lobby also has a fresh, new look while maintaining the historic charm of the arches above the porte-cochere and check-in desk, as well as the wood-stained grand staircase. The new design builds upon these iconic features with a striking chandelier, framed by a circular form in the ceiling as a centerpiece, as well as refreshed colors, textures, lighting, furniture and artwork. Another prominent element of the new lobby is a large built-in monitor above the check-in desk that can display artwork, as well as guest-centric messaging like events, snow reports, group welcomes, etc. There is also a new bell desk and concierge desk, including technology that enables guests to print their tickets in the lobby before heading out for a day of skiing. In August, as renovations got underway, The Lodge at Vail donated everything from the 56 hotel rooms to Habitat for Humanity of Eagle and Lake Counties, including lamps, artwork, mirrors, chairs, mini-refrigerators, beds and more. The donation filled six trucks and marked the largest-ever resort donation to the non-profit. Last summer, the hotel’s popular pool area was renovated, including two large side-by-side, in-ground hot tubs with a gas fireplace; furnishings; stonework and landscaping; two additional gas fire pits; a sound system with the ability to cater music to guests’ needs; heating for year-round access; and a full-service bar and commercial kitchen. This past winter, one of the two on-site restaurants, Cucina at The Lodge at Vail, also received a facelift to its bar area. Cucina is famous for its hearty breakfast buffet and après ski by its outdoor fire pit, but will also be open for dinner during this winter season serving mountain comfort cuisine. In 2011, Elway’s Vail opened at The Lodge at Vail. Named for former Denver Broncos quarterback and NFL Hall of Fame Inductee John Elway, Elway’s Vail is the restaurant’s first location outside of Denver and the third location in the collection. “Adding to our revitalizations of the pool area and the Cucina bar this year, as well as the International Wing guest rooms and ballroom and new RockResorts Spa and fitness center in 2008, this final phase of renovations completes The Lodge at Vail’s makeover, enhancing the overall guest experience,” said Ben Tutt, new general manager of The Lodge at Vail.